Professor Layton has become one of my favorite series over the course of five games, but I never think of it as such until another one drops in my lap. The same low-key quality that makes each game such a relaxing, rejuvenating bit of comfort food also makes it easy to forget when one isn't in my DS at that very moment. It's a shame that I should take something like a Layton game for granted. They're universally lovely experiences, and I revel in the genuine unwinding that I get to do while playing one. They're also formulaic. That's not a negative judgment – the formula works well. It just makes it difficult for me to evaluate them against each other. But Level-5 took some chances with Professor Layton and the Miracle Mask in the transition from DS to 3DS, ranging from minor interface and presentation tweaks to surprisingly dramatic breaks from the familiar formula. The real achievement is in making a game that still feels fundamentally like Professor Layton while also experimenting. All of the exploration has been moved to the 3DS's top screen to allow for stereoscopic visuals. As a result, the customary pre-puzzle activity of tapping around the environment to talk to people and search for hidden puzzles and hint coins has been moved to the top screen as well, which requires players to use the touchscreen to drag a magnifying glass cursor around the top screen. While it seemed convoluted to me at first, I quickly came to prefer this system, as the magnifying glass changes color to indicate an item of interest, giving me feedback on areas of the screen that random clicks do not. The new 3D character models are far from perfect, with visible polygons and hair clipping into itself, but they animate beautifully and smoothly. And when you move the cursor, the perspective of the background shifts slightly to astounding effect. Through careful texture work, the polygonal backgrounds are made to look convincingly hand-drawn, and the small camera moves make them appear panoramic. There's one other lovely tweak that the DS to 3DS upgrade brought: the font for dialogue is uncommonly beautiful for in-game text. I feel silly pointing such a minor thing out, but it improves the experience of playing the game significantly, and I'd like to encourage 3DS game developers to explore typography beyond the same bitmap fonts they all used for DS games. Stop me if you've heard this one: Professor Layton, his assistant Emmy, and his apprentice Luke visit a remote, mysterious town after one of Layton's old friends asks for his help solving a mystery. There, they come across a masked villain and a series of events that appear supernatural in origin. In the course of their investigation, they talk to all the citizens multiple times, solving over a hundred puzzles in the process. Beyond this familiar setting, Miracle Mask also flashes back to Layton's high school days, allowing you not just to learn how the future Professor would discover his aptitude for archaeology, but to see his fabulously tall hairstyle. Young Layton is every bit as well-mannered as his adult self, but he has yet to develop the poise and self-confidence required to point decisively at solved puzzles. The core of the Layton series is still present: random puzzles that might vaguely tie into the storyline. As ever, the logic puzzles designed by Akira Tago have you rearranging tiles to fit into rectangular spaces, performing tricky (but usually not difficult) mathematics, and collating clues to match people to their descriptions. I'm delighted to report that I didn't find a single puzzle about using bottles to measure out water. I hate those. The puzzles are entirely identical to those you'd see in any other Layton. Particularly clever ones including identifying a prehistoric fish based on a bite impression and pictures of three candidates in a book; slingshotting obstacles to create an unimpeded path to ricochet a projectile into a bell; and a tile puzzle that makes you arrange ten overlapping 3 by 3 tiles into a mosaic of Professor Layton's iconic top hat. If you've never played a Layton game before, you'll probably be thrown a bit by the transition from adventuring to puzzles. A character will somehow, implausibly, bring the conversation around to the subject of a puzzle, and then suddenly you're working out a math problem, or doing a slide puzzle, or untangling a knot. Everyone in the world of Layton is obsessed with puzzles, to the point that they will present them to strangers, bring them up randomly in conversation, or even hide them under theater seats. The tie between 135 logic puzzles and the storyline is always tenuous at best, but that's never a problem because puzzles are fun. The feeling of successfully solving a tricky challenge is, as ever, the best part of these games, though I don't dare celebrate too enthusiastically, because the gentlemanly decorum of the protagonist is close behind. 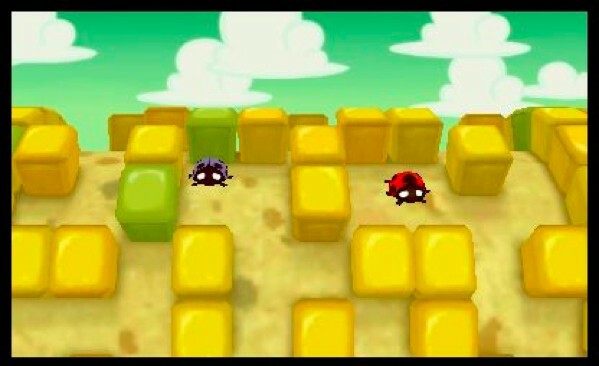 There are a few new puzzles that seem custom designed for 3D displays, like one in which you guide a ladybug along a path cut into a corncob, rotating 3D corn into your face! Even those that use fully two-dimensional art benefit from a lavish presentation. Level-5's artists give quietly beautiful background art to many puzzles, including stylized portraits of each scene's "actors" – a consistent cast of characters across dozens of unrelated puzzles, and a totally unnecessary and wonderful touch. Rather than decrying Level-5 for relying on a formula, I'm happy with the developer for providing me with such a consistent, and consistently enjoyable, experience. In any case, though the majority of the game involves familiar gameplay (in the new and improved engine), the climax of Miracle Mask finds Layton taking an excursion into another genre entirely. I don't want to give away too many details, but it's something you'd never expect to do in a Layton game ... and it fits perfectly. I encourage you to find time among all the fall releases to take a vacation in the puzzle-laden paradise of Professor Layton and the Miracle Mask. Take in the new sights. It's nice to have a moment to stop and think every year or so. This review is based on a retail copy of Professor Layton and the Miracle Mask, provided by Nintendo.